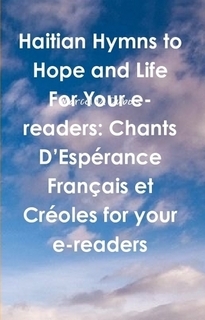 "Haitian Hymns to Hope and Life For Your e-readers: Haitian/Canadian /American/French Churches’ Most Sung Hymns On Sunday Morning and Evening Services - Chants D’Espérance Français et Créoles for your e-readers" is a labor of love compiled by Youth Pastor and Choir Director, Marcel D. Dubois, who worked with many churches and Christian brothers and sisters from Boston to New York, from Haiti to Canada, from the Caribbean region to France and elsewhere. He wants to thank each one of you for sending your Sunday morning and evening programs to him. Thanks to your contributions, he has been able to come up with the most popular, the most sung hymns from the Chants d'Esperance Francais and Creoles. This book is for you. He hopes you can use it to praise and worship HIM! If you want to contribute to this survey, you can leave your feedback and comments below. "Tell us which hymn is the most sung on Sunday morning or evening services. Tell us Why"
Choir Director Marcel Dubois would like to find out.